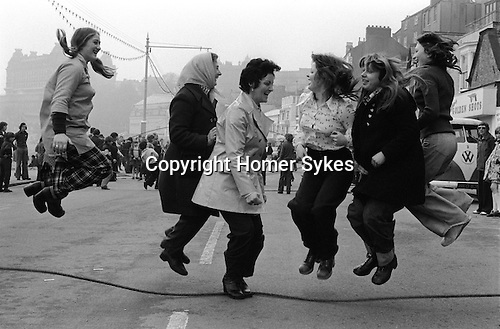 Shrove Tuesday Skipping, Scarborough, Yorkshire. England 1974.
expected to confess one's sins, or be 'shriven'. As a compensation for the earnest time ahead, games and food prohibited during Lent were indulged in with a particular fervour. Pancakes were favoured because they used forbidden ingredients such as eggs and fat. Also, the custom of bell-ringing at Shrovetide, no doubt originally a signal for parishioners to attend confession, became a vigorous activity in its own right. adults gather after lunch on the promenade at Southsands to skip with huge ropes until dusk. A new Pancake Bell was errected in the town in 1996 and the celebrations are now opened by the Town Cryer and the Mayor in full regelia now rings the Pancake Bell.